Introduction: Elizabeth Schuyler Hamilton (9 Aug. 1757-9 Nov. 1854), statesman’s wife and charity worker, was born in Albany, New York, the second daughter of Philip Schuyler, a revolutionary war general, and Catherine Van Rensselaer Schuyler. Schooled at home, her early years were typical of most young women of colonial, aristocratic families. At the age of twenty-two, she met Alexander Hamilton, a dashing aide-de-camp of General George Washington, at the home of Gertrude Cochran, her aunt, wife of John Cochran. For Elizabeth it was love at first sight, a love that remained strong through the many scandals ahead. Accepted into the Schuyler family despite his illegitimate birth and lack of wealth or social standing, Alexander Hamilton held political beliefs similar to those of his future father-in-law. Both supported a strong centralized government and General Washington. Both had been soldiers as well as members of his military staff. The entire Schuyler family revered Alexander as a young political genius. As for Alexander, it is possible that he considered marrying Elizabeth for her family’s money and status, for the Schuylers were one of the most influential families in the state of New York. Yet, his true love seemed evident in their courtship correspondence, which was intimate and childlike. Believing his sincerity, Elizabeth, with no formal education, became interested in military and political affairs, and Alexander even discussed Benedict Arnold’s treason with her. In many of his letters Alexander also expressed his worry about his poverty and ability to provide for his future wife. The pair were finally married on 14 December, 1780; he was just shy of the age of twenty-four, and she was twenty-three. The Hamiltons’ marriage was both blessed with many children and fraught with scandal and credit problems. Elizabeth bore eight children between the years 1782 and 1802, miscarrying at least once. Ironically, her eldest son Philip, aged nineteen, was killed in a duel by an associate of Aaron Burr. After Philip’s untimely death, her eldest daughter, Angelica, named after Elizabeth’s sister, went insane. Six months later, Elizabeth bore her last child, also naming him Philip. Alexander adored children, both his own and Fanny Antil, a daughter of a fellow revolutionary war veteran, whom Alexander adopted. Elizabeth’s frequent pregnancies often prevented her attendance at social functions at which Alexander was accompanied often by Elizabeth’s eldest sister, Angelica. Both of the Hamiltons adored Angelica, but Alexander’s affection appeared to exceed mere brotherly sentiment. It is unclear if this attraction actually turned into an affair. Alexander believed that his marriage vows to Elizabeth were unbreakable promises, but between 1791 and 1792 Alexander did have an affair with Maria Reynolds. Elizabeth and the children spent summers in Albany, New York, away from the disease-ridden summers of urban Philadelphia, leaving Hamilton alone. Maria claimed to be an abandoned relative of several prominent New York families, and Hamilton’s pity for her plight resulted in a liaison. Probably entrapped by Reynolds’s husband, James, Alexander publicly confessed the affair by publishing his personal account. Elizabeth forgave him; if she had not, his career and reputation would have been irrevocably ruined. Despite Alexander’s actual and rumored affairs, the Hamiltons’ personal relationship was one of mutual respect. Elizabeth accepted his flirtatiousness. Alexander continued to solicit her advice on political and family matters, as he had early in their courtship. Before their marriage, he had trusted his wife to negotiate the purchase of a house. Throughout their married life, he often read selections of his writings to her, seeking her opinion and approval. She listened to his early drafts of Washington’s “Farewell Address” and excerpts from the Federalist Papers. She probably copied some of the Federalist Papers for Alexander to distribute. Never idyllic, the Hamiltons’ marriage was hampered by incessant credit problems. Alexander resigned from military service and qualified for the bar in 1782. From 1789 to 1795, he worked for the fledgling American government as the first secretary of the treasury and as a member of President Washington’s cabinet. He resigned in 1795 and returned to his New York City law practice. The Hamiltons struggled financially, never accepting assistance from General Schuyler, with the exception of food and goods from Schuyler’s estate. With credit already stretched, Alexander bought fifteen acres in Harlem Heights, New York, to build his own estate, “The Grange,” named after his ancestral home in Scotland. Tragically, Elizabeth’s life changed dramatically in 1804 with the deaths of both her husband and father. Aaron Burr and Alexander Hamilton had quarreled over Hamilton’s alleged personal slurs against Burr’s reputation and political aspirations, and Burr challenged Hamilton to a duel, which took place on 11 July 1804. Told he was just having spasms to prevent her hysterics, Elizabeth rushed to the mortally wounded Alexander. He left Elizabeth and his family virtually destitute. Left to pay her husband’s debts and raise their children (the youngest was two), Elizabeth relied on the help of friends and family. The death of her father four months after her husband’s provided her with some financial relief through her inheritance of property and money. She was able to repurchase The Grange, which had been sold at public auction. She also petitioned the government for her husband’s army pension that he had waived. Not granted until 1837 through a special act of Congress, her petition provided her with $30,000 and included land. Even though Elizabeth spent her widowhood in poverty, she was active in charitable organizations. She held positions in the New York Orphan Asylum Society and founded orphanages in New York City and Washington, D.C. She was known to take homeless children into her own home. To establish her husband’s political legacy and repair his reputation, she spent nearly fifty years after his death collecting and preserving his papers and letters. She corresponded with and visited the leading Federalists to collect papers and other information concerning her husband. Ironically, none of her correspondence to Alexander survived, although she did save his letters to her. Throughout her life Elizabeth Hamilton staunchly defended her husband against his critics, maintaining his authorship of Washington’s “Farewell Address” and refusing to acknowledge his responsibility in the duel and sexual scandals of his life. James Monroe had accused Alexander of financial irregularities during the Reynolds affair. Steadfast until the end, Elizabeth demanded a complete apology, which Monroe would not give, but before her death he visited Elizabeth to reconcile their differences concerning her husband’s reputation. Alexander Hamilton’s papers were not published until 1850-1851 by his son, John Church Hamilton, and after the U.S. government had purchased them in 1849. 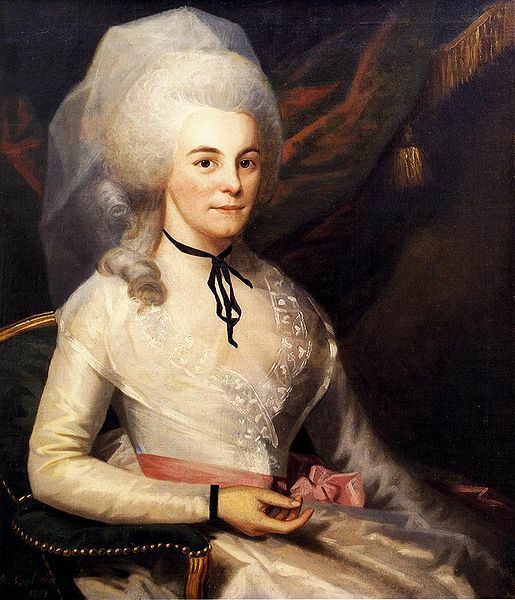 Elizabeth lived her final years in Washington, D.C., with her daughter Eliza Hamilton Holly. She was buried with her husband in the graveyard of Trinity Church in New York City. Bibliography: Most of the information on Elizabeth Hamilton must be gleaned from biographies written about her husband. Broadus Mitchell has written widely on Hamilton, including Alexander Hamilton (2 vols., 1957-1962). Allan McLane Hamilton, the grandson of Alexander and the son of Philip, the youngest child, has selected and compiled many letters and other documents written by Hamilton in The Intimate Life of Alexander Hamilton (1910). His narrative is one of the more comprehensive for information on Elizabeth. Other useful biographies include Forrest McDonald, Alexander Hamilton: A Biography (1979); Robert A. Hendrickson, The Rise and Fall of Alexander Hamilton (1981); Noemie Emery, Alexander Hamilton: An Intimate Portrait (1982); and Jacob Ernest Cooke, Alexander Hamilton (1982). For the later years of her life and charity work, see George W. Bethune, Memoirs of Mrs. Joanna Bethune (1863). There’s so much to know about her outside of her husband. Alexander is cool, but she deserves her own story told! OMG!!!!!!!!!!! SHES SOOOOOO COOOOLLLLL! I LOVE HER!!!!!!!!!! YOU SLAY GURL!